There is a reason Seven Days is a thriving, surviving and award-winning newspaper — you deserve it. Kate O'Neill's debut article is outstanding ["Hooked," February 20]. You saw an opportunity to dig into an issue deeply affecting our community, state and nation, and you fully supported it. Kudos to you, and thank you for making the news relevant and real. It was a complete lack of foresight to print a comprehensive and thoughtful article on the opioid crisis in Vermont ["Hooked," February 20] and yet fail to include a single support group in the same issue. This is basic planning from journalism school. Editor's Note: Whoops! We meant to include a note instructing readers seeking support or treatment for opioid use disorder to call 211, a free and confidential resource hotline provided by the United Way of Vermont. We've added that information to the story online; it will appear in all future Hooked stories. 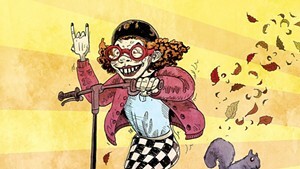 [Re "Residents Wary as Burlington Rolls Out E-Bikes and E-Scooters," February 20]: If the issue is that bikes go down the hill and not up, and the bikes can be programmed, why not: A) have the motors off or slow on the flats but kick in when on the hilly parts of town; B) lower the speed to 10 mph for uphill; and C) turn off the minute pricing when the bike starts at the bottom of the hill but is checked in at the top as an incentive to bring bikes back up? No to scooters. Flat out. 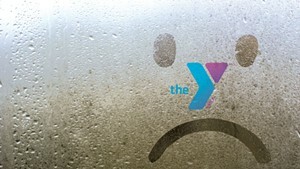 [Re 802 Much: "Steamin' Mad," February 20]: Having just read the short article about the lack of a steam room in the new YMCA, I wanted to be among those who thank Kyle Dodson and his team for designing a new building with equity at its core. I have never been comfortable with the two-tiered system at the current Y and — steam room or not — feel that a one-size-fits-all design is more just, better for our community and even better for the people who have to get used to giving up the privilege of their little private club. I have visited quite a few other YMCA facilities around the country and have always enjoyed the diversity and sense of community that emerge from amenities that everyone can share. I look forward to the new building and to being part of a Y that values justice and inclusion. There's another advantage: Open captions benefit additional audiences, as well. Immigrants, refugees and others for whom English is a foreign language have the opportunity to read along with the dialogue, improving their reading skills and/or clarifying the idioms and slang of colloquial English. In Israel, for example, all TV and movies are open-captioned in Hebrew, in part to assist immigrants in acquiring visual literacy as quickly as possible. True accessibility for one group can enhance the experience of another — and we all benefit in the end. [Re 802 Much: "Steamin' Mad," February 20]: I wish I could celebrate the steel beams going up at the new YMCA. But I am experiencing the construction as a death — of the best part of my current daily life: my time in the women's wellness center. This small, decidedly unglamorous area within the Y offers space to stretch, work out, cleanse and heat by sauna, steam room and hot tub. It is a source of great joy and connection for the women for whom it is part of their health practice. I have had many meaningful exchanges there with other teachers and medical providers, community activists, even a newspaper publisher. Older women connect with and welcome younger women and the trans community in this space. For all their talk of "community," the people who designed the new Y chose to eliminate this refuge. I mourn the only place I know where a group of lifelong Y members had a safe and friendly space to exchange knowledge and insights and help each other navigate personal and professional challenges. Women's needs and lives are never considered as important as those of their offspring. As we age, women are increasingly ignored and sidelined. 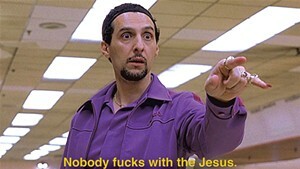 That is exactly what is happening here. 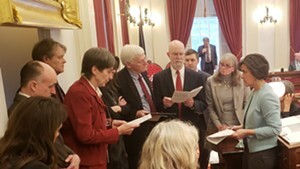 [Re Off Message: "Vermont House Passes Abortion-Rights Protections," February 21]: The Vermont abortion rights bill protects a woman's right to have an abortion — the same right she's had in Vermont for 46 years. I strongly support this bill because the people of Vermont should have the right to control their own bodies and futures. Why is this necessary? Why now? Because the United States Supreme Court could overturn Roe v. Wade in 2019. If it did, state laws would determine a woman's ability to access abortion. Vermont must make its commitment to preserving and protecting abortion rights clear. While none of us should have to justify our personal health care decisions, abortion later in pregnancy is rare and most often occurs under complex circumstances wherein a woman and her doctor need every medical option available. A woman must remain free to weigh all options relevant to her unique and specific condition while in consultation with the people she trusts, including medical providers, loved ones, counselors and religious leaders. We've seen what happens when politicians stand in the way of women's health by interfering in deeply personal health care decisions. States with onerous abortion restrictions find women and their families placed in an unimaginable bind, prohibited from ending a pregnancy despite real medical danger. Senators in Vermont must stand for the protection and preservation of reproductive rights and pass H.57. Lea is board chair of the Planned Parenthood Vermont Action Fund.